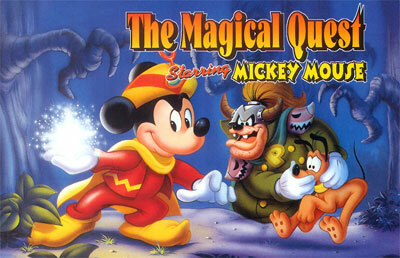 This was the first Mickey Mouse game for Super NES, featuring a traditional platform gameplay and colorful Disney-like graphics. Mickey's mission is to save his dog Pluto, who's been kidnapped and kept inside emperor Pete's castle, in a magical land, guarded by mysterious creatures. The originality of the game lies on the possibility of wearing different costumes to incorporate different characters, all taken from old Disney cartoons. Each one has a special ability. As a wizard, Mickey has magical powers; as a fireman, the mouse can deal with fire; and, as a climber, he can reach the top of high platforms.